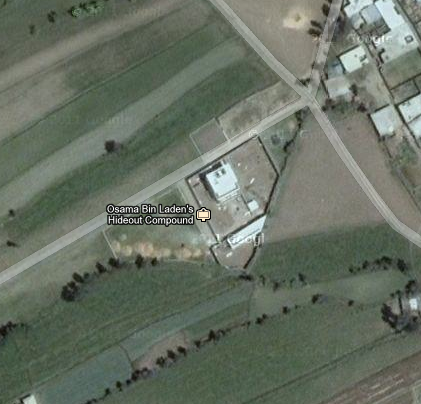 After matching the aerial view of the compound published in Tuesday’s Guardian against Google Maps I soon discovered that the site was already labelled helpfully “Osama Bin Laden’s Hideout Compound.” Presumably, this is a recent annotation. Are there any useful architectural insights to accompany the assassination this week at Abbottabad? The miserable, treeless, generic eyesore in this middle class suburb offers no gift to the landscape, the sustainability agenda or the economy of iconic architecture. Friends have pointed out to me the obvious. The hideout is a non-place, a lacuna, a gap in the network, and that contributed to the discovery of its contents. The compound apparently had no means of communicating with the outside world. In short it had no Internet connection. This placed it under suspicion and rendered it conspicuous. Questions about the presence or absence of a person, place, event or thing bring to mind the tensions within forensic observations, and hence between fact and metaphor. Perhaps architecture intersects with this occurrence if we think in terms of metaphor play: “this house is a hideout” as a metaphor. Think of an architecturally resonant metaphor: “a house is a machine.” Houses are not actually machines, like aeroplanes, typewriters and refrigerators. They are buildings. The declaration, taken literally, that a house is a machine, is false. Metaphorically, though, it is true … at least in so far as truth and falsity have relevance in this context. The “house is a hideout” metaphor entails similar questioning. The philosopher Paul Ricoeur identifies this complication or tension between truth and falsity, “is” and “is not,” as a key feature of metaphor. Metaphor leaves scope for discussion, and even dispute: perhaps houses are a kind of machine; we just need to extend the machine category a bit. Rethink the machine. Perhaps all houses are hideouts, or lairs. Hideouts are kinds of houses anyway, or perhaps secret homes. Such tensions are grist for the designer’s mill. Worrying over particular metaphors, even disputing that one is dealing in metaphor, is an important aspect of creation. Metaphors follow the “is structure”: this chair is a horse, life is a bowl of cherries, man is a wolf, A is B. What about the denial of an assertion: A is not B? Does such a negation constitute a metaphor? This is not a chair; my computer is not a machine; the man is not a human; life is not for living. If not metaphors then such assertions at least behave like metaphors. If this thing I am sitting on is not a chair then what is it; if life is not for living then what is it for? Negation not only extinguishes, but offers the potential for questioning, creation and action. In a chapter on metaphor, philosopher Giambattista Vico asserts “Poetic monsters [spring] from combinations of forms and ideas.” This early equation of metaphors and monsters further advances my deliberately oblique post on metaphor. Monster, hideout, lair: it is all metaphor, which makes it real. Vico, Giambattista. 2001. New Science: Principles of the New Science Concerning the Common Nature of Nations. London: Penguin. OBL’s hideout looks more like a prison – a structure to keep somebody inside. Perhaps certain “powers” in Pakistan wanted him off the streets but away from the Americans? If so, they made an error of judgement. If a prison then a permeable one according to today’s news. But then the story keeps changing. So why not speculate. “A house is a prison” is a popular metaphor (What Ever Happened to Baby Jane? ), but we also have “house as command post,” with couriers relaying messages in and out, possibly to the wider world via Internet cafés, an exaggeration perhaps of aspects of the modern media-saturated home. Or rather a house as a camouflage or a house of secrets. Was it a camouflage or was it a conspiracy? Metaphors can be used in many ways. The fact that there was no internet connection has no standing as a in a country like Pakistan where the majority of the population is illiterate and cannot even operate a computer. Lack of a telephone line can be justified by the overwhelming use of mobile phones. The size of the compound or house has no bearing on how educated the owners or residents are. I think here, its more about perception than anything else.